Tools such as ecology and field wildlife monitoring techniques facilitate our understanding of free-ranging wildlife populations and critical ecosystems. We are conducting ground-based research in the wilderness of northeast China, where the last wild tigers in China may inhabit. The goal of this project is to explore ways to increase tiger prey base in northeast China, by setting up pilot projects on forest farms that represent typical tiger habitat. In particular, we examined the influence of forest stand structure on wild ungulate populations, after eliminating the impacts of other key natural and artificial covariates such as forest type and poaching intensity. We would like to examine if change in the forest stand structure may help increase the relative population density of ungulates and thus help restore wild tigers dispersing from Russian Far East. 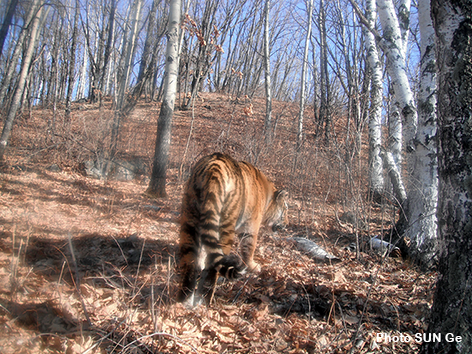 Restoration of prey base in the relatively continuous but “empty” forest is of primary concern to Amur tiger conservation in northeast China. Poaching, habitat loss and fragmentation are considered the primary causes deterring ungulates from recovery. 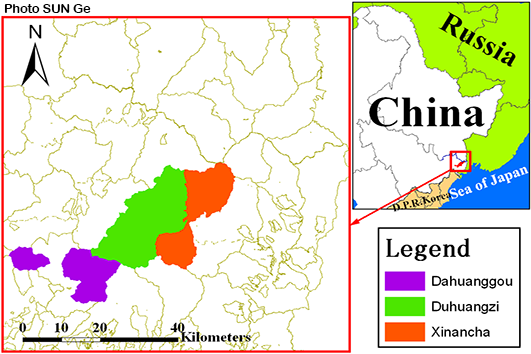 Yet another likely critical issue that has been neglected is that the management and harvesting history of forests in northeast China has led to a distribution in most regions of overly dense and monoculture forest, likely suboptimal for ungulate species. Current research and conservation plans lack the quantitative analyses to demonstrate to what extent the shortage of habitat suitable for ungulate survival is limiting the recovery of the Amur tiger. In addition, most of the current conservation strategies do not include an examination of the temporal and spatial pattern of poaching intensity in this region, hindering the designing and implementation of an efficient conservation plan. 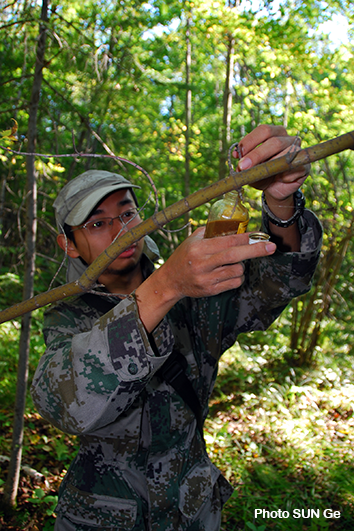 We have thus set field stations in Dahuangou, Duhuangzi and Xinancha Forest Farms, a tract of tiger habitats in Jilin near the border to Russia and North Korea, to estimate the influences of such variables on primary tiger prey species, or, wild boar, red deer, roe deer, and sika deer. A forest stand is classified according to its succession stage: open, dense, understory, complex and savanna. Infrared-sensor camera-traps are then used to estimate the relative abundance of animals in different forest stands. In addition, the impact of poaching will be assessed by transect survey of snare distribution. At last, with GIS mapping and modeling tools such as ENFA and RSF, we will construct a landscape-level map of ungulate’s habitat suitability of the surveyed area. Ultimately, we aim to explore a strategy to increase the food supply of the large carnivore and make the future tiger recovery in China more optimistic.